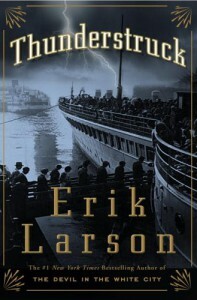 Seems like Larson was trying to do the same thing here as with The Devil in the White City - parallel stories of two historical personages/events that eventually come together. Although the intersection of Marconi (or at least Marconi's technology) and putative murderer Hawley Crippen (since this book's publication, DNA evidence has shown that the body found in Crippen's cellar was not only NOT Cora Crippen/Belle Elmore, but was in fact MALE) was a little more clear than the stories of architect Daniel Burnham & serial killer H.H. Holmes in White City, I thought the book overall was less successful.